Recorded in sevaral spelling forms including: Darwin, Derwin, Darwen and Darwent, this Emglish surname has two possible origins. The first is from the pre 7th Century personal name "Deorwine", a compound of the elements "deor" meaning dear, and "wine", a friend hence, "Dear friend". This was probably used as both a baptismal name of enderarment for a child, but also as a nickname for a close kinsman or partner. The given name as Deorwine was first recorded in England in the Pipe Rolls of the county of Essex in 1070, and in the Latinzed form as Derewinus in the tax register known as the "Feet of Fines" in the year 1176 in the county of Buckinghamshire. The surname from this source was first recorded in the early 13th Century, (see below). The second origin is locational from the town of Darwen. This place is named from the river Darwent in Lancashire on which it stands. This was derived from the word "derva" meaning oak, and hence the river where oaks were common: This place was recorded as "Derewent" in the year 1208. 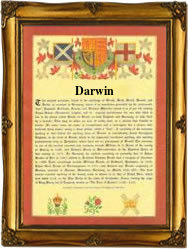 Early examples of the name recording taken from surviving post medieval church registers include: Elizabeth Darwin who was christened at the church of Saint Martin's in the Fields, Westminster, on March 30th 1636, whilst in Victorian times Charles Darwin became the foremost authority on the origins of mankind. The first recorded spelling of the family name is shown to be that of John Derewin. This was dated 1219, in the county of Essex, during the reign of King Henry 111rd, 1216 - 1272. Surnames became necessary when governments introduced personal taxation. In England this was known as Poll Tax. Throughout the centuries, surnames in every country have continued to "develop" often leading to astonishing variants of the original spelling.